Climate change in the form of global warming is visible, tangible, measurable and is one of the most signifcant risks facing the world. During the conceptualization as the objective of the paper, we have determined the analysis of the impact of climate change on agricultural production and the ways of reduction of negative impacts. The most important results of the present work are the analysis of the implications of climate change on agricultural production and food security, adaptation possibilities of agriculture and the role of agriculture insurance. The main conclusions are that climate change negatively affects agricultural production and food security, especially in subtropical areas while there is limited potential for a positive impact of climate change in the northern hemisphere. There are two possible choices for agricultural producers, under the implications of climate change, that are not necessarily mutually exclusive: 1) fnding a long term sustainable solution based on the adaptation and 2) obtaining insurance coverage. 1. Adger, W.N. (2007): in Climate Change 2007: Impacts, Adaptation and Vulnerability, eds Parry ML , Canziani OF , Palutikof JP , van der Linden PJ and Hanson CE, Cambridge University Press, Cambridge, UK, pp. 717–743. 2. Baez, M.S., Wong, S. (2007): Insurance in emerging markets: sound development; greenfeld for agricultural insurance. Sigma No 1/2007, Swiss Re, Zurich. 3. Burke, M., Lobell, D. (2010): Climate Effects on Food Security: An Overview in Lobell, D. and Burke, M. (eds): Climate Change and Food Security: Adapting Agriculture to a Warmer World, Springer, New York. 4. EC (2008): Climate Change: The Challenges for Agriculture. Fact Sheet, DirectorateGeneral for Agriculture and Rural Development, European Commission, Brussels. 6. Enciklopedija leksikografskog zavoda. (1967): Jugoslovenski leksikografski zavod, Zagreb. 7. Enjolras, G., Sentis, P. (2008): The Main Determinants of Insurance Purchase: An Empirical Study on Crop Insurance Policies in France. Paper presented at the 12th EAAE Congress “People, Food and Environments: Global Trends and European Strategies”, Gent (Belgium), 26-29 August. 8. FAO (2016a): Climate change and food security: risks and responses. Food and Agricultural Organization of the United Nations, Rome. 10. Heintz, T. (2008):Winds of Change for Agricultural Risk. Catastrophe Risk Management, Guy Carpenter, December, 2008. 11. Howden, S.M., Soussana, J.F., Tubiello, F.N., Chettri, N., Dunlop, M., Meinke, H. (2007): Adapting agriculture to climate change. Proceedings of the National Academy of Sciences of the United States of America, Vol. 104, No. 50, pp. 19691–19696. 12. IPCC (2014): Climate change 2014: synthesis report. Contribution of Working Groups I, II and III to the Fifth Assessment Report of the Intergovernmental Panel on Climate Change. Core Writing Team, R.K. Pachauri & L.A. Meyer, eds. Geneva, Switzerland. 13. Iturrioz, R. (2009): Agricultural Insurance. Primer Series on Insurance, The World Bank, Washington, DC. 15. McClean, C.J. Lovett, J.C., Kuper, W., Hannah, L., Sommer, J.H., Barthlott, W., Taplin, J.R. (2005): African Plant Diversity and Climate Change, Annals of the Missouri Botanical Garden, Vol. 92, No. 2, pp. 139-152. 17. Pejanović, R.., Njegomir, V. (2011): Problemi upravljanja rizicima u poljoprivredi. Ekonomika poljoprivrede, Vol. 58, No. 1, pp. 91-103. 19. Raulston, J.M., Richardson, J.W., Outlaw, J.L., Knapek, G.M. (2010): Does Crop Insurance Reduce the Need for Cash Reserves in Savings Accounts? Paper presented at the SAEA Annual Meeting, Orlando, FL, February 6-9. 20. Sherrick, B.J., Barry, P.J., Ellinger, P.N. , Schnitkey, G.D. (2004): Factors Inﬂuencing Farmers’ Crop Insurance Decisions. 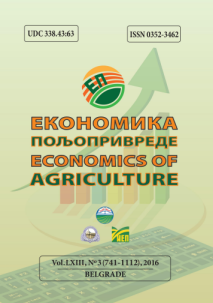 American Journal of Agricultural Economics, Vol. 86, No. 1, pp. 103–114. 21. Steht, N., von Storch, H. (1999): Klima, Wetter, Mensch. Verlag CHBeck, Munich. 22. Tubiello, F.N., Jean-Francois, S., Howden, S.M. (2007): Crop and pasture response to climate change. Proceedings of the National Academy of Sciences of the United States of America(PNAS), Vol. 104, No. 50, pp. 19686-19690. 24. World Bank (2009): Insurance for the Poor Program, Public Intervention for Agricultural Insurance, World Bank, New York. NJEGOMIR, Vladimir; PEJANOVIĆ, Radovan; MAKSIMOVIĆ, Goran. CLIMATE CHANGE RISKS, AGRICULTURAL PRODUCTION, AND THE ROLE OF INSURANCE. Economics of Agriculture, [S.l. ], v. 63, n. 3, p. 1015-1029, aug. 2016. ISSN 2334-8453. Available at: <http://ea.bg.ac.rs/index.php/EA/article/view/213>. Date accessed: 19 apr. 2019. doi: https://doi.org/10.5937/ekoPolj1603015N.